Excellent water distribution at low pressure and precipitation. Energy saving with wedge drive design. 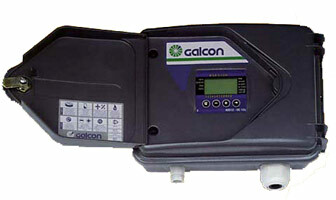 General field use on solid set irrigation system. All overhead irrigation crops on hand lines, solid-set or mechanically moved systems. Wide spacing and center pivots machines. Horse pastures, paddocks, arenas, feedlots, dust control, sod farms. Heavy-duty brass and stainless-steel construction for improved durability and performance. Corrosion resistant stainless-steel spring and shaft. 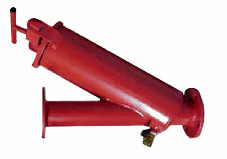 Sprinkler construction of 3 nozzles with extended nozzle arm for wide diameter coverage at maximum performance. Non-clog straightening vane to ensure excellent coverage in wind conditions. Pivots and travelers. Sugarcane, horse pastures, padlocks, arenas,feedlots, dust control, sod farms. 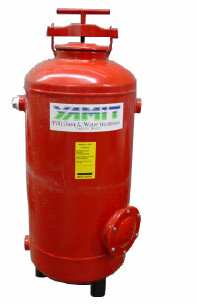 Vacuum Breakers provides protection to the potable water supply from contamination in low hazard applications such as flexible connections over domestic fixtures and external hose taps. Dual checks provide protection to the potable water supply from contamination in low hazard applications like meter connections on domestic properties. 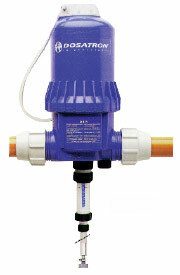 The Silver Bullet Series 4000 Reduced Pressure Zone Assemblies are designed to provide protection of the potable water supply in accordance with national codes. This series can be used where approved by the local authority having jurisdiction on health hazard cross connections. 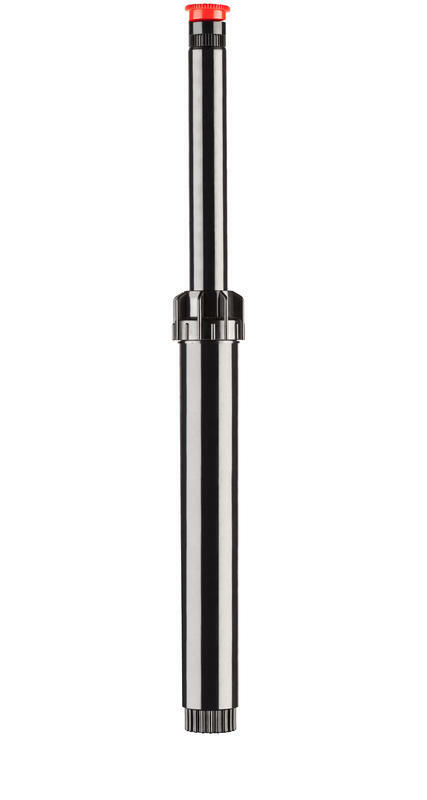 Series 4000 features short lay length, lightweight stainless steel body, corrosive resistant stainless steel relief valve, and patented cam-check assembly. Stainless steel construction provides long term corrosion protection and maximum strength. Short end-to-end dimensions make retrofit easy. 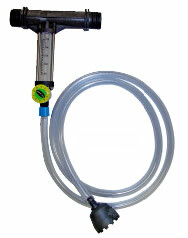 Patented Cam-Check Assembly provides maximum flow at low pressure drop. Compact construction allows for smaller enclosures. Stainless steel relief valve features a balanced rolling diaphragm to eliminate sliding seals and lower maintenance costs. All internal metal parts: 300 Series stainless steel. 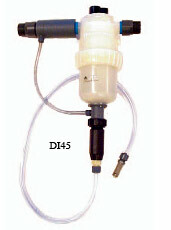 Agricultural, turf and home watering systems. Agriculture, turf and home watering systems. Use 3M Brand 316 to electrically connect two or three wire ends, insulate the connection and provide a moisture resistant seal. Recommended for use with low energy underground circuit wires, Sprinkler Systems, Landscape Lighting or other moisture resistant wires for applications of less than 30 volts. Use part DBR, which includes a Scotchlok® Y Electrical Spring Connector, to electrically connect two or more pre-stripped copper wire ends in a pigtail application and moisture seal the connection for direct burial. Use part DBY, which includes a Scotchlok® Y Electrical Spring Connector, to electrically connect two or more pre-stripped copper wire ends in a pigtail application and moisture seal the connection for direct burial. Use 3M Brand UBI to electrically connect two or three wire ends, insulate the connection and provide a moisture resistant seal. Recommended for use with low energy underground circuit wires, Sprinkler Systems, Landscape Lighting or other moisture resistant wires for applications of less than 30 volts. Used for starting pumps from 24VAC output irrigation controller. Used for protection in drip, spray and sprinkler watering systems. Filter element made of high grade plastic with disc’s in stack form. 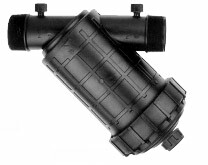 90° entry and exit point allows water to flow along the length of filter, water flows through DISCʼS while solid particles can be removed by opening drain valve. Flow Rate : 13000 – 48000 lph. 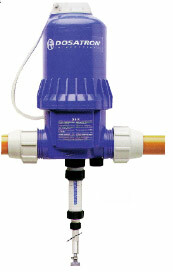 Flow Rate : 11000 – 180000 lph. Flow Rate : 30000 – 90000 lph. 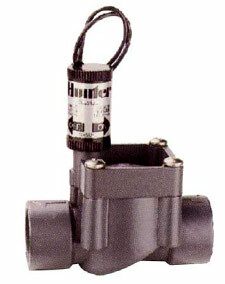 Inlet/Outlet on axis of 180° allows direct flow of water along the length of screen, water passes through screen while solid particles can be removed by opening drain valve. Mesh sizes 40, 60, 80, 120, 140. Flow Rate : 10000 – 220000 lph. Water flows freely on a spiral path along the length of the filters chamber. Centrifugal force seperates the solid particles from the water. Solid particles gravitate downwards to be collected in underflow chamber. Clean water flow’s from the top of flter. Used to allow simple manifolding of solenoid valves into irrigation manifolds. Assembles and dismantles easily for maintenance. 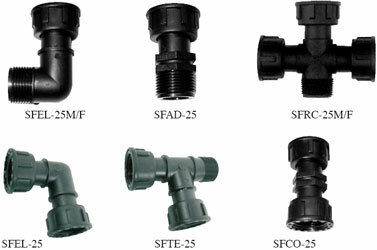 High Quality Poly Propylene fittings for irrigation. 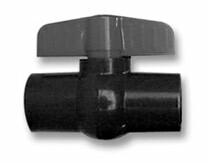 Complete range of threaded fittings used on all irrigation pipe work systems. Bushes, female tees and elbows. Acetal designed for long term performance. Bolts – zinc plated or stainless steel (option extra). 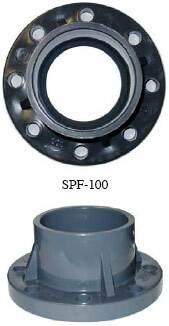 Seal – resilient seat sealing “O”ring made from nitrile rubber. Maximum working pressure of 800Kpa. Transition fitting from metal to plastic for all water pipe networks. Operating pressure PN16 (1600kPa)Male/female threads are made of nickled brass and manufactured to gas thread standard. 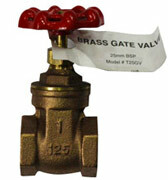 Male/female threads are made of nickled brass and manufactured to gas thread standard. Rural to Metric Fitting Conversion Kits available. 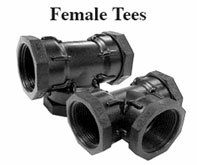 Complete range of compression fittings allows assembly on metric polyethylene pipes. Disassembly not required for all sizes. All components work together smoothly to guarantee a reliable and efficient joint. Body, Nut, thrust ring: virgin polypropylene in master batches, UV stabilized. Connecting metric poly pipe to flanged face pipework. Body, Nut, thrust ring: virgin polypropylene in master batches. Pressure UPVC pipe networks carrying water. High pressure water tapping bands designed to replace metal fittings in buried irrigation pipe networks, noryl tapping bands provide the same resistance to physical abuse while guaranteeing a permanent resistance to corrosion. Body – two bands bolted together to form a clamp around the pipe. Halves constructed NORYL GTX 820 resin (20% glass filled). Noryl is a blend of polystyrene and poly phenylene oxide which is noted for its rigidity, heat resistance, good electrical and chemical resistance with strong dimensional stability. Seal – resilient seat sealing ring ‘E’ lip nitrile rubber. 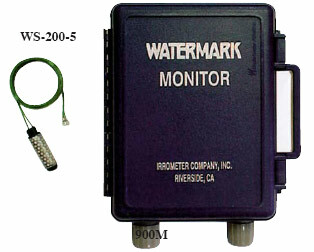 Watermark soil moisture automation works with the irrigation controller to allow water to be applied only when necessary. This advanced method of irrigation control provides good water conservation, while maintaining the health of the landscape. Applying just the right amount of water, no more than necessary and no less than required, to your turf and landscape. Two concentric electrodes buried in granular matrix material, held in place by a stainless steel case. Matrix material provides buffering for the effect of salinity levels in soil. 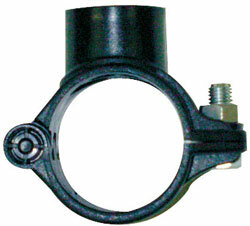 Sensor manufactured from non-corrosive parts, 50mm x 21mm in dimension. Studies have proven that WATERMARK moisture control matches plant/turf need for water and regulates irrigation to this need. The Adjustability of the “switch” allows for finetuning the control to specific climates, plant materials and soils. Just like a thermostat tells the furnace or air conditioner to go on, the WATERMARK ELECTRO NIC MODULE tells the irrigation time clock if water is needed. If the soil is drier than the adjustable setting, irrigation will take place. If the soil is wetter than the setting, that irrigation cycle will not occur. The WATERMARK ELECTRONIC MODULE eliminates the need to reprogram the time clock for seasonal changes or during rainy periods, hot spells or vactions. 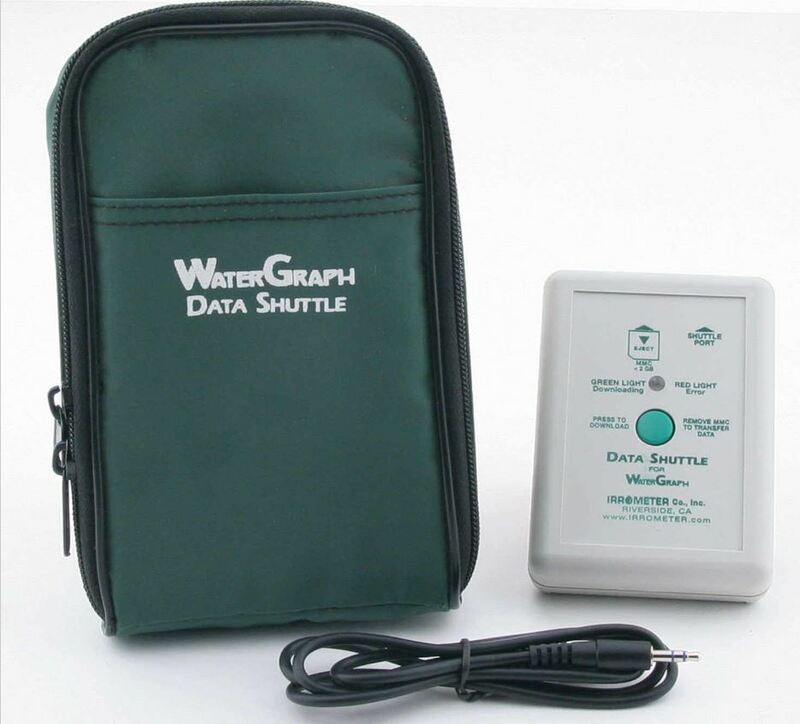 The Data Shuttle option for the Watermark Monitor will allow you to download data from multiple Monitors with a PDA and then transfer that downloaded data to a computer for display. The PDA will not display the data, it only collccts and transfers data. Simple “one tap” download procedure to collect data from the monitor. 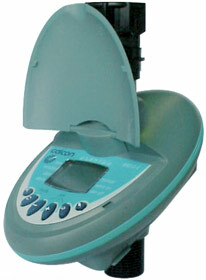 To transfer the collected data to your computer, it takes “one tap” on the PDA and one mouse click in watergraph. 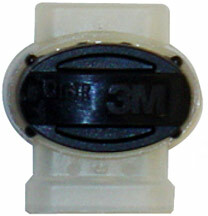 Male serial plug (DB9) to shuttle pin connector cable that connects from the customer supplied PDA to female serial cable to the Watermark Monitor’s Shuttle port. 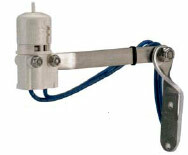 The RX-1, a rain switch developed for use with 24V output sprinkler controllers to interrupt the scheduled watering cycle in the event of rain. 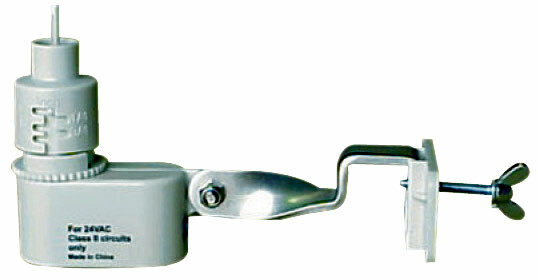 The RX-1 mounts easily to a gutter or wall. 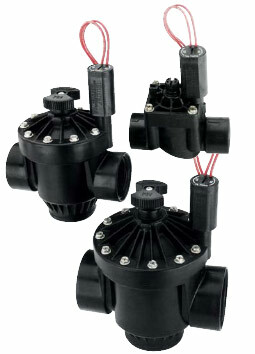 Three wires for compatibillity with most sprinkler controllers. Blue wire used for normal open situations. Materials: ABS with UV inhibitors. Vent Ring: Adjustable to varying drying times for hydroscopic disc set. fouled by debris, giving the Wireless Rain-Clik™ the most highly accurate operation. No need for water to accumulate for shutoff. Variety of choices depending on the job site; gutter or wall mounts. Adjust the irrigation re-start to account for varying amount of rain. Typical wired system limitations vanish. Built-in bypass switch on receiver panel. Installs on any system in minutes, no stringing or wiring. There’s nothing more embarrassing – or more wasteful or costly – than an irrigation system that runs when it doesn’t have to…in the rain. 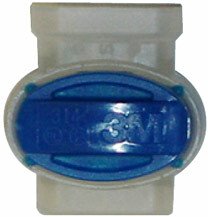 Mini-Clik provides the simplest, most effective to prevent sprinklers from coming on during or after rain. It easily installs on any automatic irrigation system, then shuts sprinklers off in a storm and keeps them off, automatically compensating for the amount of rainfall that occurred. Disks absorb water and expand proportionally to the amount of rain that fell. As the moisture-laden disks expand, they eventually activate a switch that interrupts the circuit from the controller to the solenoid valves. Once dry, they contract and release the switch. 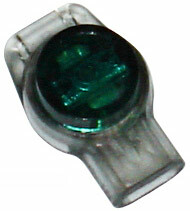 thus, Mini-Clik automatically resets without ever affecting the controller. 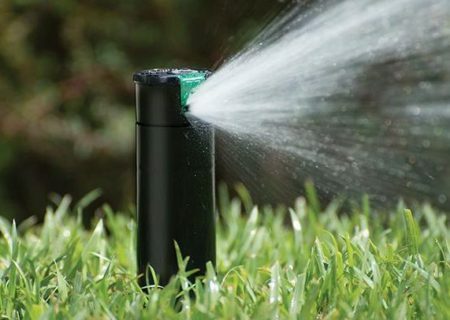 There’s no better way to ensure that a system isn’t watering when it isn’t necessary. Wiring: MC2: Typically interupts the common ground wire between the solenoid valves and the controller. Simple operation, reliable performance. 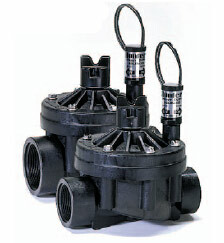 The economical residential valve that can handle the toughest conditions. SRV features a durable high-grade PVC globe body plus a rugged diaphragm custom-crafted to withstand the challenge of vigorous day-to-day use. In addition, the SRV boasts a diaphragm support to prevent stress failure, an internal manual bleed to keep valve box dry, and the heavyduty Hunter solenoid. Plus, to meet the particular needs of each individual system you install, the SRV is available in either flow control or non-flow control models. Made of durable PVC and stainless steel to resist wear. Adjust the flow of each zone on a system. Permits direct colvent connection to PVC pipe. 230mA holding current, 50 cycles. exceptionally high pressures. For a long-lasting valve that can deliver dependable performance at commercial sites, this is the heavy-duty workhorse you can count on. 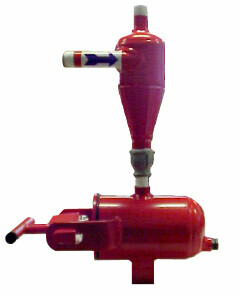 Created to handle the wide range of conditions different sites will bring, this valve includes both a fabric reinforced diaphragm and flow control as standard features, and can consistently withsatnd pressures of up to 220PSI while handling the continual hammer that such forces will produce. 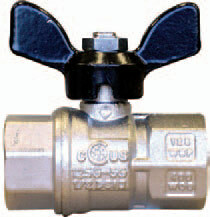 The ICV also offers the added option of the Accu-Set™ pressure regulator to maintain a safe, constant water pressure level. 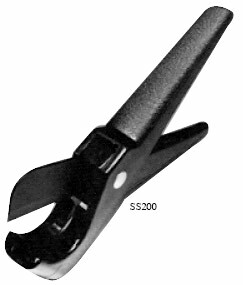 Plus, it’s exceptionally easy to service, with bonnet fasteners that can be loosened and tightened using a variety of common contractor tools. 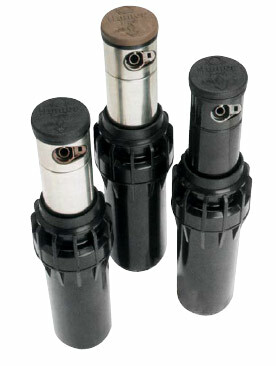 Accu-Set™: 138kPa minimum operating pressure. 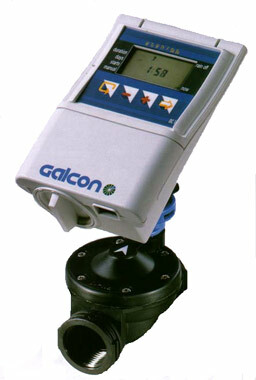 A heavy-duty, high pressure workhorse, with the added benefit of contamination protection. Dirt. It’s a valve’s biggest enemy. But aren’t filters supposed to keep a valve dirt free? Well, most can keep out the big stuff, but what about the microscopic particles – like minerals and algae – that can build up on the diaphragm filter? After all, that kind of contamination, over time, can lead to the product’s premature failure. That’s why Hunter developed Filter Sentry™, a scouring mechanism which continuously works whenever the ICV is operating. Added to all the other outstanding features of the ICV, it results in the most durable and reliable valve available that can consistently withstand pressures of up to 220 PSI. The ICV Filter Sentry™. When it comes to valve performance, there’s no better way to stand guard over dirt. 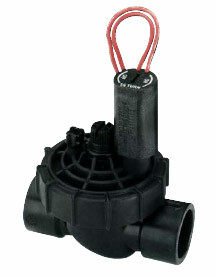 Designed for use in all irrigation systems, turf, landscape and agricultural watering projects. 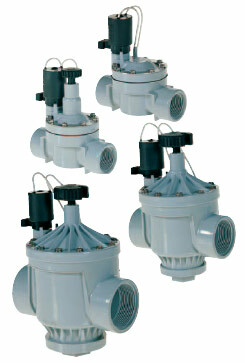 Globe and Angle configuration for flexibility in design and installation for 40 and 50mm valves. 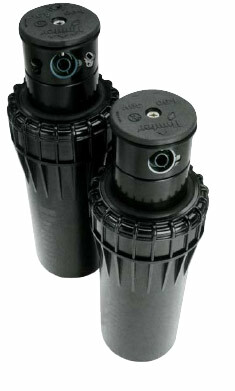 Rugged PVC construction to withstand constant 1033kPa pressure and 19 – 378 LPM. Slow closing to prevent water hammer. 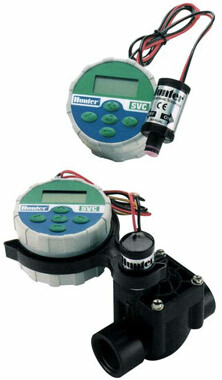 Accepts latching solenoid for use with battery operated controllers (model: DC/LC E2002). Pressure: 100 – 1034 kPa. Flow: 19 – 378 LPM. 24VAC cycle solenoid power requirement: 0.41 A inrush current, 0.23 A holding current. Ribbed, heavy duty PVC contruction for UV resistance and corrosion protection. Durable heavy duty moulded diaphragm. 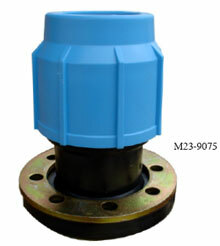 Mini control valve for use in drip or spray/jet home watering systmes. 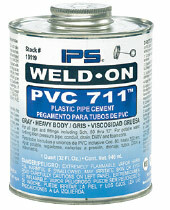 Red Hot Blue Glue™ is for use on all types of PVC plastic pipeapplications, Type I and Type II. It is approved for pressure and non-pressure, potable and non-potable, water, turf, ag, conduit, foam core, sewer, DWV and flexible PVC piping. In high pressure, large diameter or very demanding applications, use of purple primer is recommended. Installation instructions are located on each can as well as in our installation brochure. We recommend that you also follow the pipe and fitting manufacturers directions in conjunction with our instructions to insure a viable joint. Red Hot is considerd a fast setting solvent cement, work quickly to assure a quality joint. Red Hot Blue Glue™ is a mixture of 100% active solvents, PVC resin and colorant dye. Red Hot Blue Glue™ is listed by the International Association of Plumbing & Mechanical Officials (IAPMO) and carries the UPC Shield. It is additionally listed by NSF International for use on potable water, sewer, drain, waste and vent systems and carries the NSF symbol and exceeds ASTM D-2564. For safety and health precautions please consult our Material Safety Data Sheet on thios product. Always use in a well-ventilated environment. Never test with compressed gas or air. for solvent cementing in very cold conditions, please consult our cold weather guidelines. Always wear safety gloves and avoid spills. Red Hot Blue Glue™ is a very aggressive, blue, medium bodied, fast setting PVC solvent cement. It is chemically the “hottest” solvent cement formulation available on the market today. It is designed to be used on all schedules and classes of PVC pipe through 200mm, schedule 80 through 100mm. Red Hot is ideal for both quick pressurisation and demanding conditions. Red Hot is our best solvent for all PVC applications through 200mm, including wet or cold condition applications. Red Hot does not require the use of a purple primer, unless specified by local code. The “shelf life” of Red Hot Blue Glue™ is 3 years in an unopened can from the date stamped on the can. Always seal the can tightly between uses, to prevent the solvent from becoming thickened, stringy or jelled. If the solvent becomes thickened, stringy or jelled, dispose of it properly, it cannot be “re-activated” or thinned. Amigo™ is for use on all types of PVC plastic pipe applications,Type I and Type II. It is approved for pressure and non-pressure, potable and nonpotable, water, turf, ag, conduit, foam core, sewer, DWV and flexible PVC piping. 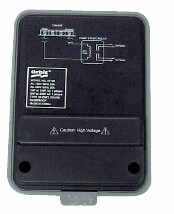 Installation instructions are located on each can as well as in our installation brochure. We recommend that you also follow the pipe and fitting manufacturers directions in conjunction with our instructions to insure a viable joint. We recommend the use of a primer with Amigo™, especially on pressure applications, we recommend our Purple Primer™. Amigo™ is a clear, regular bodied, fast setting PVC solvent cement. Amigo™ is designed to be used on all schedules of PVC pipe through 100mm diameter, except Schedule 80. We recommend the use of purple primer with Amigo™. Amigo™ is a mixture of 100% active solvents and PVC resin. Amigo™ is listed by the International Association of Plumbing & Mechanical Officials (IAPMO) and carries the UPC Shield. It is additinally listed by NSF International for use on potable water, sewer, drain, waste and vent systems and carries the NSF symbol and exceeds ASTM D-2564. Max VOC Emissions: 600 G/L, per SQCAQMD Rule 1168, Method 316A. The “shelf life” of Amigo™ is 3 years in an unopened can from the date stamped on the can. Always seal the can tightly between uses, to prevent the solvent from becoming thickened, stringy or jelled. If the solvent becomes thickened, stringy or jelled, dispose of it properly, it cannot be “re-activated” or thinned. 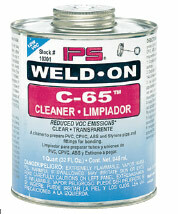 Weld-On C-65 Cleaner is a clear, reduced VOC emissions, water-thin, free flowing solvent system. It is specifically formulated to remove grease, oil and dirt from the bond surfaces of PVC, CPVC, ABS and Styrene pipe and fittings. It is approved for FlowGuard® Gold™ CTS plumbing systems. It is not to be used in place of primer. 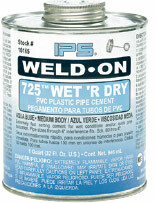 Weld-On C-65 is an all purpose cleaner and can be used on all sizes, classes and schedules of PVC, CPVC, ABS and Styrene pipe and fittings. It is to be used only as a cleaner, in conjunction with the appropriate primer and/or cement combination. It also has been used as a brush cleaner. Detailed directions on making solvent cemented joints are printed on the container label. An installation video covering solvent cementing is available. It not only describes the basic principles of solvent cementing, but also covers the handling, storage and use of our products. It is highly recommended that the installer review the instructions supplied by the pipe and fitting manufacturer. The shelf life expectancy of this product in tightly sealed containers is unlimited. Stability of the product is limited by the permanence of the container and the evaporation of the solvent when container is open.It should be used as received in its original container. Adding of solvents or other foreign materials is not recommended. 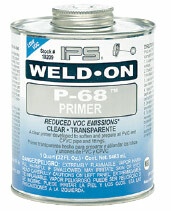 Weld-On P-68 Primer is a purple or clear, reduced VOC emissions,nonbodied, fast acting, water-thin solvent. It is distinctly coloured purple so detection of its use in a joint can be made. The strong action of P-68 Primer softens and dissolves the joining surfaces of PVC and CPVC pipe and fittings very rapidly. 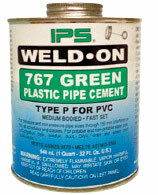 Weld-On P-68 Primer, when used in conjunction with appropriate Weld-On cements, will make consistently strong, well fused joints. 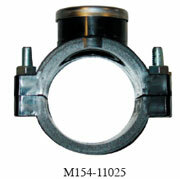 It is essential that the joining surfaces of pipe and fittings be softened prior to assembly. The main function of this primer is to expedite the penetration and softening of thee surfaces. Its rate of penetration into the joining surfaces is much more rapid than that of cement alone. 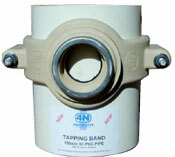 It is suitable for use with all types, classes and schedules of PVC and CPVC pipe and fittings. 3 year expectancy in tightly sealed containers. The date of the manufacturer is stamped on the bottom of the container. Stability of the product is limited to the permanence of the container and the evaporation of the solvent when container is open. Weld-On P-68 meets ASTM F-656, SCAQMD Rule 1168/316A and is listed by NSF International for use on potable water, sewer, drain, waste and vent systems. P-68 Purple only is listed by the International Association of Plumbing & Mechanical Officials (IAPMO) and carries the Uniform Plumbing Code (UPC) seal. This primer is suitable for use with PVC and CPVC piping systems approved by (SBCC) Southern Building Code Congress and (BOCA) Building Officials Congress of America. Any spray head body that uses female-threaded nozzles can have the ultimate in versatility with a aHunter nozzle. And the most versatile of the wide array of hunter nozlles is the Adjustable Arc nozzle. With an easy turn by hand – no tools for 25 to 360 degrees to keep the spray in the areas as designed. 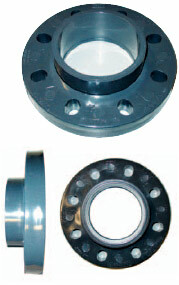 In addition, the radius can be reduced up to 25% without changing the pattern distribution. Thus, virtually any landscape needs can be met, including those areas that require custom arcs. Today, more and more landscapes are calling for a nozzle that can be precisely set to handle meandering walkways or atypical, hard-to-handle sharp angles. 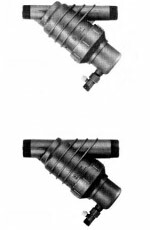 Why keep an inventory of the many different odd arc nozzles that you would seldom use? When you stock Hunter Adjustable Arc nozzles, you’ll always have just the right nozzle…no matter what the job is. Most nozzles have been designed specifically to provide optimum efficiency at the standard angles of 90, 180 and 360 degrees. And while most expanses of turf call for the use of such nozzles, today more and more landscapes are requiring a nozzle that can deliver effective coverage to sites whose plot plans don’t fall into these standard angles. Irregularly shaped planter beds and meandering walkways create landscapes with odd angles that are in need of an irrigation solution that can provide effective coverage. Hunter Adjustable Arc nozzles can be set at any angle from 25 to 360 degrees, allowing sprinklers to be fine-tuned to exactly the precise pattern needed. You’ll never need worry about having to much coverage (eliminating the wasted water that would normally end up overshooting your lawn and land on the sidewalk) or too little (no more dry spots for those few extra degrees of grass that other nozzles can’t quite reach). Best of all, no tools are required to adjust the arc, it’s all done easily by hand. 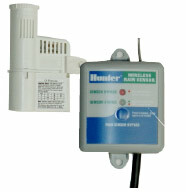 The unique pop-up design of the Hunter Micro-Spray Nozzle, coupled with the fact that it attaches directly to a pop-up sprinkler, makes this alternative to drip a winner. When not in use, both the nozzle and spray head body retract, so nothing sticks up above the surface. 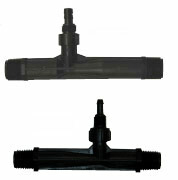 Hunter Short Radius Nozzles permit well-controlled easy watering of planter boxes and bed areas. These nozzles (in 2-, 4-, and 6-foot radius versions) are just the answer for small spaces that have longed for a better solution than trying to drastically reduce the radius range on a nozzle designed for longer throws. To accomodate the needs of the long narrow planting strips, Hunter has the industry’s first left and right 1.5 x 4.6m corner strip nozzles, and a 1.5 x 9.1m side strip nozzle. 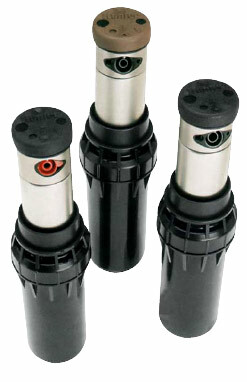 All three nozzles can be adjusted down 25% without the loss of efficient pattern distribution. Combining the convenience of customised arc selection and a lower appliction rate, this dial-setting, adjustable arc nozzle offers a stream spray that throws as far out as 5.5m at 276kPA. 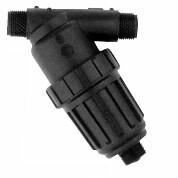 An outstanding nozzle to use on slopes and ground cover areas with tight soils that require a low precipitation rate. 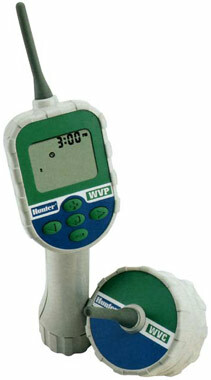 Hunter presents a way to meet your deep watering needs that offers considerably more efficiency than drip irrigation. With the ability to compensate for pressure differences, the Hunter PCB (and PCN, which attaches directly to pop-up spray bodies) allows the output of water to remain constant regardless of the input pressure, resulting in a precise application never before achieved in bubblers. The same holds true with the MSBN and 5-CST-B nozzles, designed for deep watering of larger planted areas. Now, every plant, shrub or tree can receive the same amount of water required with no excess runoff or waste. Best of all, because it’s so simple to install, you’ll have the perfect alternative to drip…no fancy filtration, no unsighlty above-ground tubes, and considerably less chance of damage. For a more attractive, more efficient way to deep water, let the idea of Hunter’s bubbler products to sink in. With the pressure compensating nozzle (PCN), you get all the advantages over traditional drip irrigation plus a product that sits atop a riser that retracts into the ground when not in use. It’s the most tamper proof, eye appealing method of deep watering available today (attention specifiers…you’re going to like this). Four different PCB models means that you can choose from colourcoded flow rates of either 0.91, 1.91, 3.81 or 7.61 litres per minute to eliminate guesswork and guarantee that all your greenery gets exactly the water it needs. Or choose the AFB model which pressure compensates to a 7.61 LPM flow and can be fine-tuned with a stainless steel screw adjustment. A Hunter exclusive! Four streams on the half-circle, eight streams on the full-circle discharge water to more effectively cover a large area needed in many planted zones. And because it installs on a pop-up sprinkler, the bubbler retracts when not irrigating, which prevents damage (used on a 12′ pop-up, the sprinkler will clear the plants).